High quality drawings, colorful coloring pages, a working game concept. 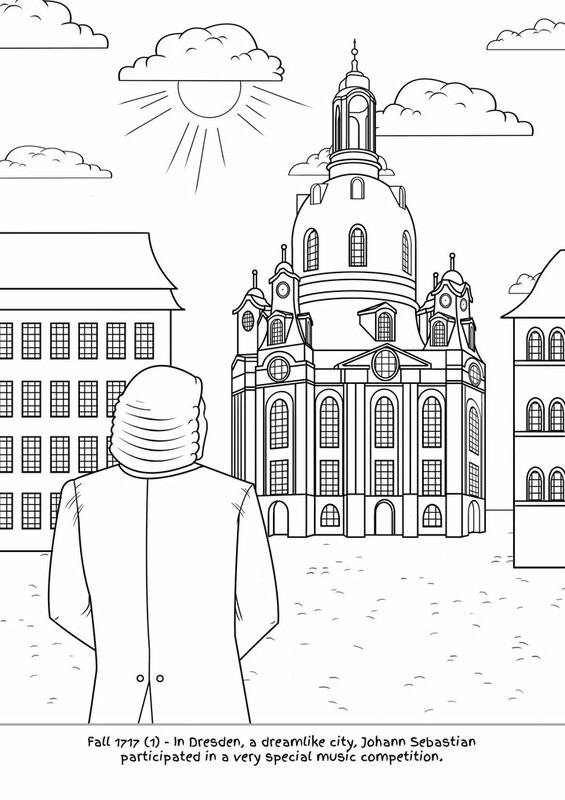 From Bach's coloring book to Bach's kindergarten game. A first step towards classical music. 24 coloring patterns must be cut out and serve as a coloring page for each child. And immediately after this preparation the "group adventure Bach" can begin. By the way, you can read the gameplay better. 1 of 24 coloring pages drawn by a cousin Bach (... third degree and in the 10th generation, but who really care about these details?). 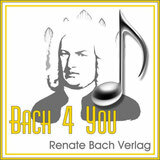 This was another brook, and published his coloring book and Bach kindergarten play in the publishing house "Bach 4 You". More Bach ... - is almost impossible. All children stand up in a row. A painting contest is now taking place. Tell the children that, together with the educators, they want to paint and explore the life of one of the greatest musicians of all time. Each child gets a painting suggestion. All children are now allowed to change the coloring list proposals - for those who want to -10 minutes. Afterwards, all children receive the DIN A4 drawings for the small coloring proposals. Each child now paints his drawing with paint pens, crayons or with watercolors, according to his or her choice of the nursery. When the work of art is finished, each artist signs his artwork at the lower right or the lower left - as always. Maybe only with a smiley face - or you can do this before writing your own name. All works of art are now ordered by the children in order. The educators help with this - with the logic of the life course of Bach and according to the annual figures. Explain what happens in Bach's life - a fun together! It is about the teamwork of the kids among themselves and the teamwork between kids and educators. Without training, the educators recognize the order of the annual figures. Finally, if all the pictures are in the correct order (... each picture should have a distance of one meter on the floor), the children are asked to choose the most amazing artwork. They do it best by placing themselves behind their favorite picture - not next to each other, but behind each other. If two pictures have the same number of votes, the children should determine the best in a selection. If there are two pictures in third place, there are just two third places (disappointments are reduced). The three pictures with the most votes get the three (four) best placements glued to the picture with Tesa film. Afterwards, all pictures are hung in the correct historical order with Tesa on a wall. On this day, however, all the kids are taking home their coloring pages. There, the topic is automatically picked up again with the parents. After four weeks each child can also take his picture home with him. A third time, "classical music" is an indirect conversation. In this way, the children are cautiously approached to an increasingly difficult subject to the mediating theme. The Bach kindergarten game also prepares to learn a musical instrument later on. A lot of democratic co-operation is an educational part of the game. The kids can exchange their "tasks", choose the best picture together, and report on the best of all the world's greatest musicians. Graduated steps prepare the topic in repetitions. The order of the motifs to be laid down later is a great fun, in which the kids arrange the works together with the educators. The coloring book is crucial, but the logic plays an important role. This game is intended for a whole group of children. The painting of pictures and the subsequent "working out" of the correct sequence (... according to the exciting life of the composer from Thuringia) in a team with the educators is the theme of the "classical music" a first time (... certainly with many Kids). In various stages the children are integrated into the project several times - but also the parents at home. Classical music stands in such a challenging competition to today's pop music in all shades that a first approach to enthusiasm can not consist in making kids for "Bach & Co." , But solely in approaching the subject playfully and cautiously, and above all not to "deter" the music in a first step. Especially not with a selection of unsuitable pieces of music. Our mission "Johann Sebastian Bach" - to spread the work and the life of the composer - is reflected in this offer most effectively and clearly - not to inspire Bach, but a first germ of possible interest not immediately and to eternity To suffocate. The author himself did not find classical music until after decades, because - for the first time, "confronted" with classical music - both the "wrong" composers and the selection of the "wrong works"
In this sense, the coloring book and, later, the biography about Bach for children are the first building blocks to bring to mind a matter that has an incredible hard "start position" alongside Lady Gaga, the Toten Hosen and Justin Bieber. Step by step. This is - as a step two, so to speak - the right reading for all those who were already enthusiastic about painting Bach: the biography about Bach for children. And maybe also for those of the kids, who would like stories about Bach actually quite great, but coloring on the contrary is really uncool.